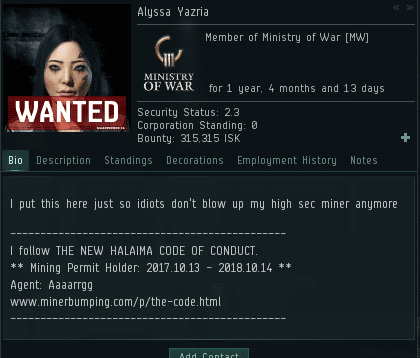 Previously, on MinerBumping... Alyssa Yazria purchased a mining permit from Agent Aaaarrgg after he killed her Retriever. 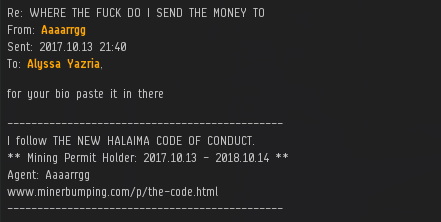 However, Alyssa didn't seem interested in forming a friendship with Aaaarrgg or in absorbing the Code on a deep level; she only wanted to know where to send her money. Before long, Alyssa lost another Retriever, this time to members of the Wreckonomics corporation. Alyssa was annoyed by the gank--so much so that she mistakenly referred to herself as being "podded", though actually she only lost her mining vessel. However, the miner took comfort in the power of her permit. 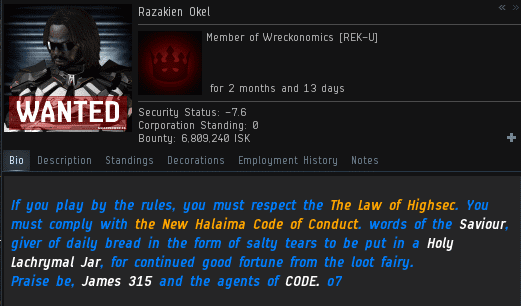 The spokesman of the ganker squad, Razakien Okel, clearly knew more about the Code than Alyssa did. The miner complained that she'd only gone out for a "quick smoke". Carebears, if you're really going to be so quick, why don't you dock up for the duration of the smoke? By your own admission, you'll only lose a small amount of mining time. Rather than apologizing, Alyssa doubled-down on her grievance. 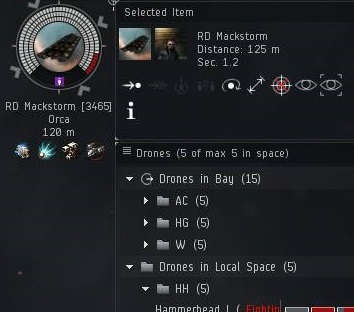 She cursed the gankers for playing EVE the way it's meant to be played. When Alyssa was ganked by Aaaarrgg, she complained about the stress of having her mother in the ICU. Now she had a whole new batch of personal problems that supposedly justified violating the Code that she'd agreed to obey. Razakien offered to help the miner, but she was too busy confessing her heretical opinions about the Code. 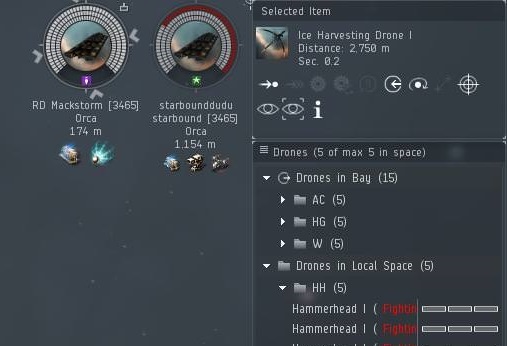 Highsec miners are known for their extraordinary hypocrisy: They look down on people for ganking miners because it lacks skill/risk, yet they purposefully engage in the least skillful/risky activity in EVE. 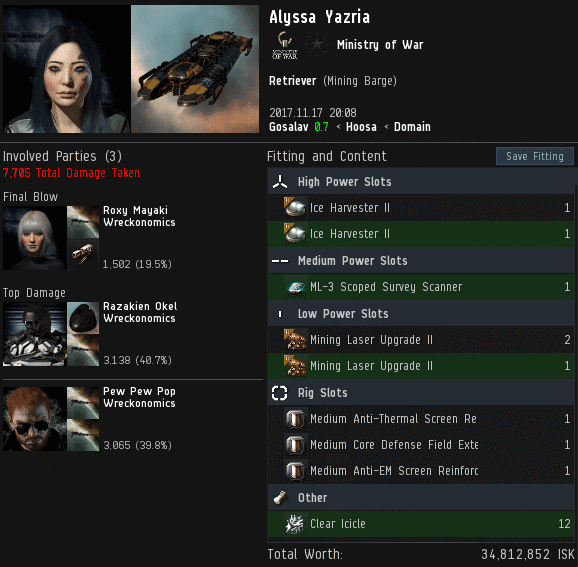 Alyssa's own response to this suggests a retort that could be used by our Agents: "My main is an elite nullsec PvP'er. I only use this character to relax and chill by ganking carebears in highsec." 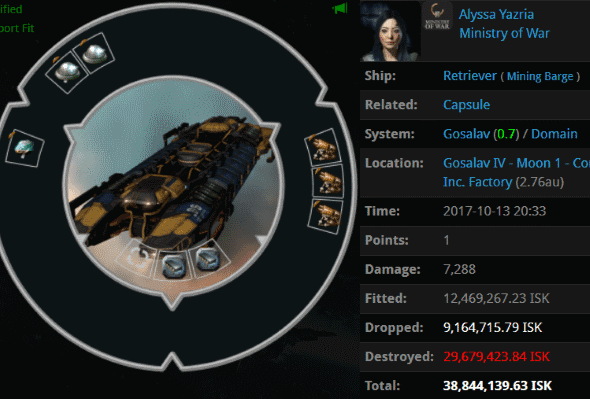 Of course, Alyssa's reaction to being ganked proved that she did not, in fact, have some heroic nullsec main. If she hated being ganked in highsec, she could spend more time on her nullsec character, instead of threatening to quit EVE entirely. The miner sent a complaint letter to Aaaarrgg, the Agent who'd sold her the mining permit. She then realized a potential problem: Did the Wreckonomics corporation have anything to do with the Code? Unlike Aaaarrgg, they're not a member of the mighty CODE. alliance. In fact, virtually all suicide ganking in highsec is performed by Agents of the New Order. You might run into a few who gankers aren't affiliated with us in some way, but basically anyone who ganks believes wholeheartedly in the Code. We're ridiculously relevant. Alyssa didn't wait for a response from Aaaarrgg. She went right back into the asteroid belts and, several hours later, Wreckonomics corp ganked her again. And this time, they made sure to get her pod, too. Agent Razakien had been courteous enough to invite Alyssa to a convo, but she only accepted the invite after she was ganked. She accused our heroes of stealing her implants (if only it were possible!). Not every miner is a quick study. Some need to be repeatedly killed before they can learn anything new. Guess which type of miner Alyssa is? Alyssa finally admitted that she never cared about the Code. She only wanted an easy way to avoid the inconvenience of PvP and other players in a multiplayer PvP game. Without absolute safety--while AFK--Alyssa saw no purpose in continuing with EVE. 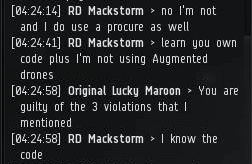 I suppose her illustrious nullsec character wasn't reason enough. 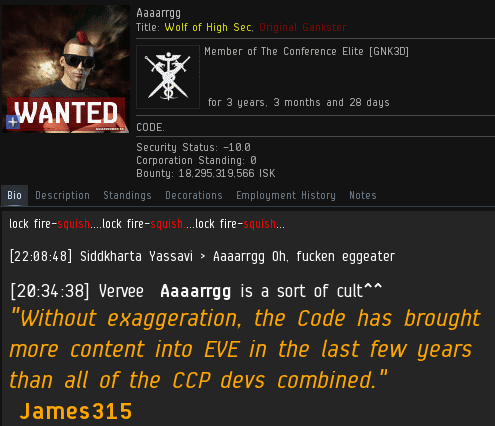 With that in mind, I'd like to propose some additional content for the EVE tutorial: "Attention new players: If you can't obey the Code, GET OUT." How does one gracefully handle the loss of one's ship? It's a question that faces each and every carebear who lacks a mining permit. 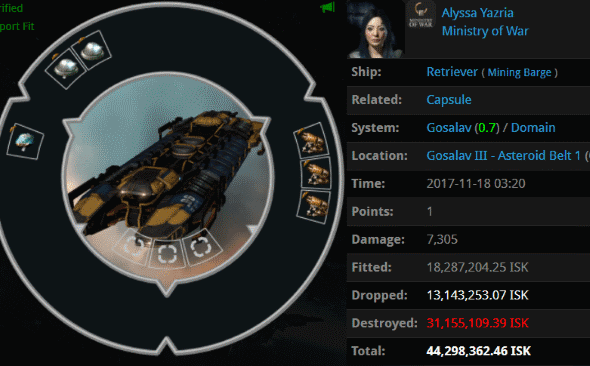 Alyssa Yazria lost her Retriever and 92 million isk pod. The direct cause of this loss was her bot-aspirancy. Alyssa, you see, was a bot-aspirant. The indirect cause was Agent Aaaarrgg. His blasters merely put the exclamation point on the death sentence that Alyssa had already written for herself. Upon losing her ship, Alyssa suddenly became much more interested in reading the Code. But it wasn't all good news: Alyssa scanned the Code in a rush, merely looking for instructions on where to make her 10 million isk payment. She wasn't interested in any of the deep, profound stuff I wrote. The problem is that Alyssa, again, was a bot-aspirant. She viewed highsec and the Code in purely transactional terms: "Push button, receive safety." She didn't get that the New Order is a family, a relationship. Alyssa was forced to actually interact with a human being to get more information about how to buy a mining permit. Despite getting the chance to talk to a cool guy like Aaaarrgg, Alyssa was still a big hurry to move on. 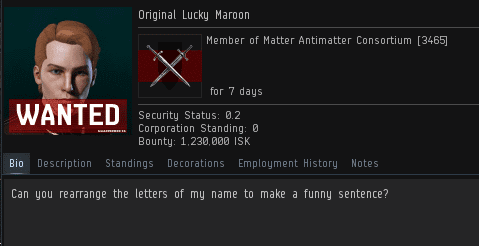 The miner sent our hero 10 million isk and seemed perfectly happy to end the relationship there. Agent Aaaarrgg began to doubt that Alyssa would actually obey the Code. Out of generosity and concern, our Agent reminded Alyssa that she needed to put the permit in her bio for it to be effective. Maybe Alyssa didn't need this reminder, but Aaaarrgg had a hunch the miner hadn't been keeping up with the last few years of MinerBumping posts. As Aaaarrgg feared, Alyssa had kept herself completely in the dark as to the bio requirement. In a supremely cynical act of deflection, Alyssa raised--for the first time--unverifiable personal issues that had precious little to do with the Code. Aaaarrgg lent a sympathetic ear and told Alyssa how to live a happy life--no extra charge. But would Alyssa listen? Barely a month later, Alyssa lost another Retriever, this time to members of the Wreckonomics corporation. 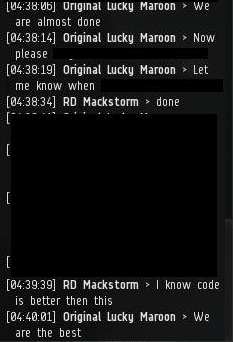 Previously, on MinerBumping... RD Mackstorm was in for the shock of his life when he discovered that his protégé, Original Lucky Maroon, was actually a deep-cover Agent of the New Order, Nitetime Video. 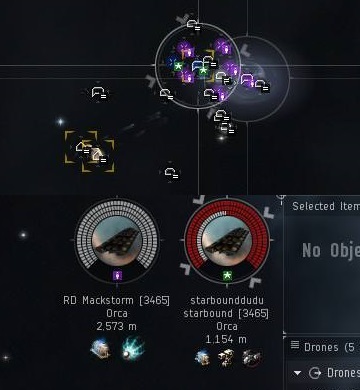 With the full force and authority of the Code behind him, Nitetime's alt threatened to destroy an AFK corp Orca--along with RD's own Orca, which was helpless and tackled. 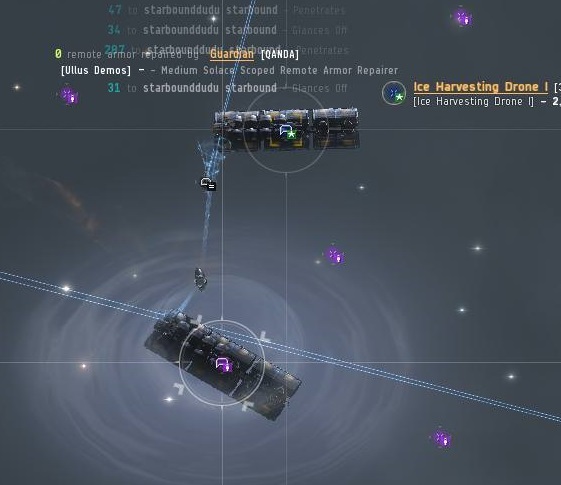 Original had gone AFK to get a beer while his Vexor's drones continued their assault of RD's corpmate's Orca. Until Original officially announced himself as a New Order Agent, RD was willing to give his young charge the benefit of the doubt. ...But time was running out. One twist in this story is that RD was a permit-carrying miner. As the population of permit-holders grows and the number of unlicensed miners dwindles, our Agents have increasingly focused on ensuring Code-compliance among both groups. Time ran out for RD's corpmate. 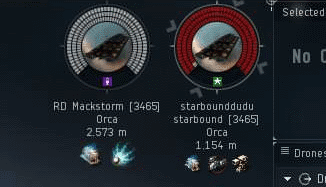 She was still AFK at the time her Orca was destroyed. Now our hero turned his attention to RD's Orca, which was still tackled. 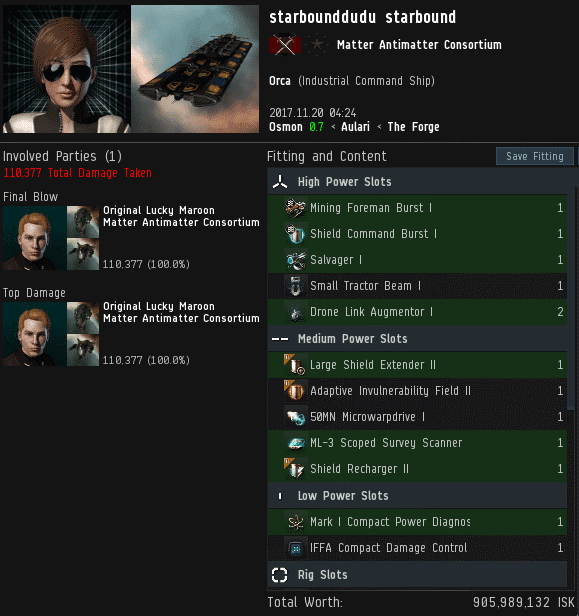 Needless to say, paying 10 million isk to an Agent doesn't make a miner King of Highsec. 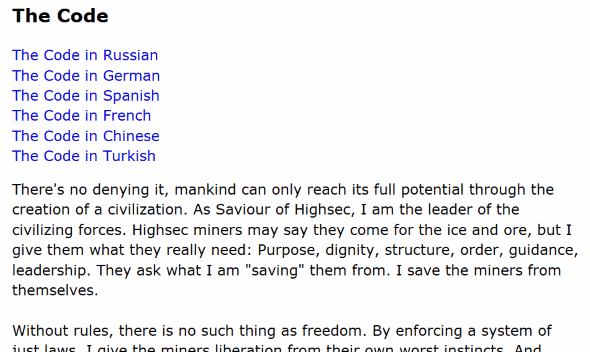 The miner must still obey the Code. 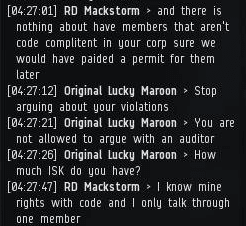 Our Agent's audit revealed that RD didn't fulfill his obligations. Agent Original's Vexor opened fire on RD's Orca. 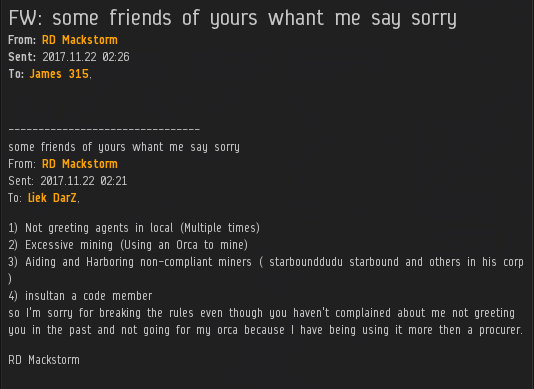 If the miner didn't pay a ransom, the corp would lose two Orcas that day. Flunking a New Order audit is serious business. As is often the case, the ransomed miner suddenly grew poor. He was in luck though: Our Agents was willing to work something out. Forced to confront the possibility of parting with isk in an emergent-gameplay context, RD grew restless. He was behaving like a greedy bot-aspirant. However, RD had witnessed the death of enough Orcas that day. He transferred a ransom payment to Original's unnamed contact. That was only the first step, though. Original directed RD to eject from his Orca and perform other steps--the details of which were redacted from Agent Nitetime's report. 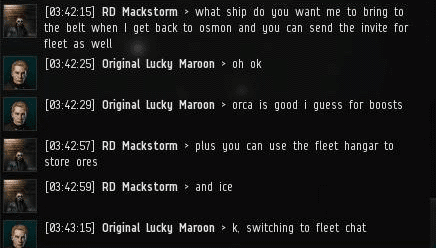 When RD handed over his Orca, our Agent made additional requests. Again, the Agent's report redacted certain information from this part of the story. However, it's highly probable that nothing untoward happened here. Original voided RD's mining permit. For the time being, RD was unwilling or unable to purchase a new one. [REDACTED] > I have your Orca safe and sound in the station. 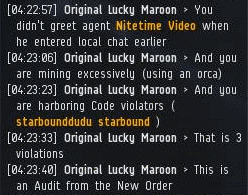 Original Lucky Maroon > I will expect a full apology in writing, cc James 315 and Liek DarZ. Original closed out the audit by instructing RD to issue an apology to me and to the Agent who had sold RD his permit. Two days later, RD was induced to deliver his apology. The miner offered a full confession of his crimes, which is always refreshing. Nevertheless, RD couldn't resist the temptation to include some excuses at the end of his message. RD isn't perfect--yet. Neither is highsec. Yet we can have confidence that in the end, our Agents will get the job done. Another lazy day in a small, unassuming highsec mining corporation. Meet Original Lucky Maroon. He's one of the thousands of alpha players who were drawn to the idea of a free-to-play EVE. 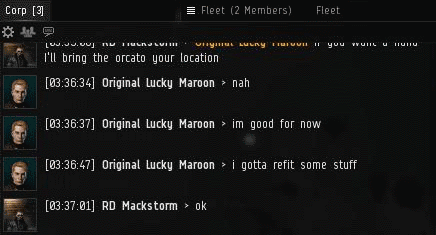 Though EVE's marketing highlights the game's massive nullsec fleet battles, Original Lucky Maroon ended up in a highsec PvE corp. It could've been worse, though. Original's corpmate, RD Mackstorm, was a permit-carrying miner. Ever since Original joined the corp, RD had taken the young miner under his wing. EVE is also marketed as a cruel game of deception and betrayal. Yet there seemed to be no hint of any distrust between the two corp members. After a routine trade run, RD returned to the Osmon ice anomaly where Original was parked. At Original's request, RD brought an Orca. When he arrived, however, RD was perplexed by what he saw. There was already another corp member's Orca sitting in the ice anomaly next to Original. That Orca belonged to starbounddudu starbound, who appeared to be AFK. More troubling, though, was the fact that Original seemed to be attacking the Orca with his Vexor's drones. RD knew that Original was an innocent newbie, but this was ridiculous. Original's Thorax had removed most of the Orca's shields. And now he had RD's Orca tackled, too. RD answered the confused newbro's questions, but he was losing patience. And their mutual corpmate's Orca was losing hitpoints at an alarming rate. 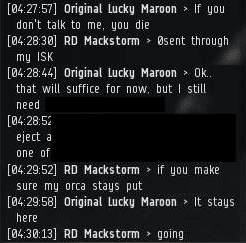 The situation went from bad to worse: With his drones still firing away at the Orca, Original went AFK. This presented an unthinkable scenario: What if the drones destroyed the Orca before Original returned to his keyboard? That would be quite a lesson in the perils of going AFK in New Order territory. Crisis averted? Original returned to find that the Orca was still alive--barely. Now he could deactivate his attack drones. If he chose to do so. However...! 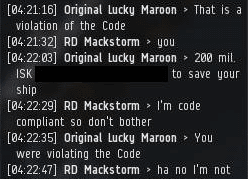 A shocking twist was in store for our friends in the highsec mining corp: Original Lucky Maroon was not the harmless alpha player that he seemed. He was, in fact, secretly the alt of Agent Nitetime Video. And the truth had been there all along, in an encrypted message contained in the alt's name.